Description: This poster is an offset litho is in black and red, issued by FEDTRAW, Johannesburg. 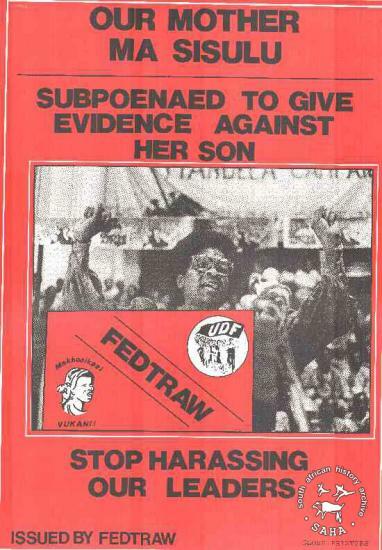 This poster depicts Albertina Sisulu, the UDF preidents, was subpoenaed to give evidence against her nephew, who was on trial for liberation movement activities. 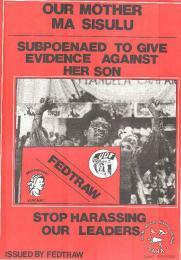 The text reads: "OUR MOTHER : MA SISULU : SUPOENAED TO GIVE : EVIDENCE AGAINST : HER SON : STOP HARASSING : OUR LEADERS : ISSUED BY FEDTRAW GLOBE PRINTERS".Digitised by Specialised Archival Solutions in 2009. Reproduced in "Images of Defiance: South African Resistance posters in the 1980s" on page 88 (number 159) of the 1991 SAHA / Ravan Press edition and the 2004 SAHA / STE Publishers edition. It also appears in the SAHA Exhibition Kit - Women.